Just made this yesterday for a church pot luck, but ended up using 2 layers of cheesecake and 1 layer of red velvet because one of the cake layers broke into pieces coming out of the pan. I didn’t even get a bite! It was gone before I made it to the dessert table, with people scooping up crumbs with their fingers. I just tried the red velvet cheesecake at the cheesecake factory and was craving to replicate it. I found your blog and decided to try it out. I used Duncan Hines Red Velvet box cake mix just for simplicity sake and it still turned out great, with a little less work. Thanks for posting the receipe! Is that really 3 sticks of butter in the frosting? Did you use salted or unsalted? Hey there! I know you posted this months ago, but hopefully you’ll see this comment and be able to help with my question. I’m planning on making this for a coworkers birthday/halloween cake next weekend and I wasn’t sure if it would be big enough, as is. Around how many servings/slices do you think this cake yields? So, I realize I’m entirely late for the party, but WOW! This is one gorgeous dessert. I love that red velvet recipe, but I think you’ve found a way to make it even better. BEAUTIFUL work, Erin! I saw this months ago and finally made it for my daughter’s family birthday party. It was a huge hit! Thanks for the step by step instructions and perfect recipes. We originally had this at cheesecake factory and this one is just as good if not better. This is AWESOME!! I am most definitely going to try this for the upcoming Thanksgiving holiday!! It looks amazing!! Thank you so much for sharing!! Thank you for this recipe. It is very detailed, but one thing I don’t understand is why wrap bottom half of pan in foil? I really can’t picture it in my head, can you please break down the “Bottom Half” part for me. Thank you in advance! Basically wrap the bottom and lower outside edge of the cheesecake pan to prevent water from getting in. Does that make better sense? WOW! I have had this bookmarked forever. I look at it, oh…weekly… and finally I made it. SUPER easy. And SO SO SO delicious. It is definitely going to be our Christmas dinner dessert. Also… 2 things: I ended up making a little less frosting… I only had 2 sticks of butter left. It worked just fine. AND… I didn’t get the cheesecake layer made last night. So I made it first thing this morning. I took it out of the oven and let it cool on the counter for about 30 minutes… put foil over the top… and put it straight into the freezer. It was frozen in about 2 hours. Just in case anyone else is tight on time. Hey Erin, I made this cake over the last 2 days and just as you said it was a little time consuming but not difficult. I must say your instructions were excellent and I didn’t have to ‘assume’ anything. I did put a little bit of frosting on the bottom layer as glue for the cheesecake layer but none between the cheesecake and the top layer. I cut the first piece immediately after taking the cake out of the fridge and the one tricky bit was when cutting it the top layer separated from the cheesecake. Perhaps this wouldn’t have happened if I had waited a while before cutting it so the cheesecake would be softer and the top layer would stick to it. I haven’t tasted it yet but as I cut the red velvet layers to level them I of course had to eat the tops and then as I had to trim the cheesecake to fit the other layers I had to try that and then of course what was I going to do with the excess frosting? So if each component was delicious then I can only imagine how the finished product will taste. Thanks for a great recipe! hi, i came across this recipe the other day when i was doing research for desserts to make for a dinner party i was having. i tried it and everyone LOVED it. only one piece was left and of course my husband promptly took care of it! thank you so much! I just found your recipe and printed it can not wait to make this. It looks amazing! Great job. This cake looks amazing! I was looking for a dessert to make for Christmas Day, and I think this would be perfect. I’m not sure if you will see this, but I did have a question. I went to my local grocery store today, and they don’t carry cake flour. Can I substitute all purpose flour? Thanks! No cake flour! Boo! Just to be sure you didn’t miss it, the brand I always see is called Swans Down and it looks like this. It’s in a box, not a bag like regular flours. Also, the blogger Baking Bites has a wonderful write up on subbing all purpose flour for cake flour. You can read all about it here. I have the cheesecake waiting in the freezer and the cake in the fridge. I’m thinking of icing it with whipped cream instead of the creamcheese icing. would this take away too much from the cake. I was thinking maybe it’s too much cream cheese and the whipping cream would lighten it up. Maybe crumb coat it with the cream cheese icing first? The whipped cream would definitely lighten it up. I’m just unsure of how stable it would be. Would you frost it with the whipped cream right before serving? If so, I think it would be okay, especially if you did a crumb coat of the cream cheese icing. I hope that helps! Let me know how it turns out! I’m just in the process of making two of these cakes (one for my family and one for my boyfriend’s) for Christmas eve and Christmas. I’ve never made a cheesecake before so I’m crossing my fingers! My son’s girlfriend made this cake and brought it to our Christmas dinner last night. It was off the chart delicious and beautiful. Hi Erin….I’m very grateful to have come across your blog in my search for a red velvet cheesecake recipe. It gave me a light at the end of the three day process it took me to pull off such a wonderful dessert! I started with baking the cheesecake Thursday evening, baked the cakes Christmas eve day and assembled it Christmas day, yesterday, and it was a hit! The perfect ending to a wonderful Christmas, Thank you!!! I made this cake for Thanksgiving, and it was awesome.. Everyone loved it and it barely lasted 3 days. Then my Aunt requested that I make it for her for Christmas; So I made it again for her family, and this is day 2 and its almost gone. This cake is delicious, a big hit! Today was the fourth time I’ve made this. Until now I’ve followed the recipe. However, I learned a couple of things making this cake this time…. you can’t rush this “too much”. My cheesecake layer wasn’t frozen “solid” and it was VERY difficult to maneuver onto the layer. Also, somehow, in the middle of making this (while my child was napping) I realized I was out of vegetable oil. I melted 3 sticks of butter (YIKES, but that is 1 1/2 cups). DO NOT DO THIS. It made the cake FALL APART. It is delicious, but looks awful. Glad this cake was “just” for us and some really good friends. Anyway, thought I’d pass along my “don’t do’s”. Hope you had a wonderful Christmas, and have a blessed New Year. When I saw this cake it reminded me of Suicide Cake I used to buy at Worman’s Bakery in San Marco, Jacksonville, FL during the 80’s. It wasn’t red velvet, but chocolaty fudge frosting blanketing luscious chocolate cake with a thick layer of their scrumptious cheesecake in the middle. I’m sure they named it Suicide Cake because you just wanted to die after you’d devoured it. Or maybe you knew you’d never eat anything as delicious, ever again. Either way, it was relished spoonful by calorie laden spoonful in the car, and never EVER made it home. Thanks for jogging the delicious memory. I’ve been after a proper cheesecake recipe for some time – this worked wonderfully, thanks! this is my finished product. i have to say that the cheesecake isnt my favorite, but i loved the red velvet, and that was the best and fluffiest cream cheese icing ever. I had a ton of fun making this. F*** me… this looks awesome! I made this cake last night. It was amazing!!!! I am so excited to try this out; I make dessert every time I go to my boyfriend’s house for a couple days as thanks to his family. They are going to die when I bring this. It looks positively heavenly 😀 I’m so glad I found your site! Wow! Looks gorgeous and I can imagine tastes amazing. I’ve only made red velvet cake once, but not with a filling like this. Cheesecake is my fave! I have made a red velvet cheesecake and it came out delicious also but try making a chocolate cheesecake for you chocolate lovers out there. Take two chocolate layers with a cheesecake middle, on top of the chocolate layers top it with carmel with roasted pecans or walnuts with the cheesecake in the middle–ooh wee so delicious. my boyfriend, usually the lazy type, caught a quick glance of me stumbling across this recipe last month. “WE MUST MAKE THIS SACRAMENT,” he said! 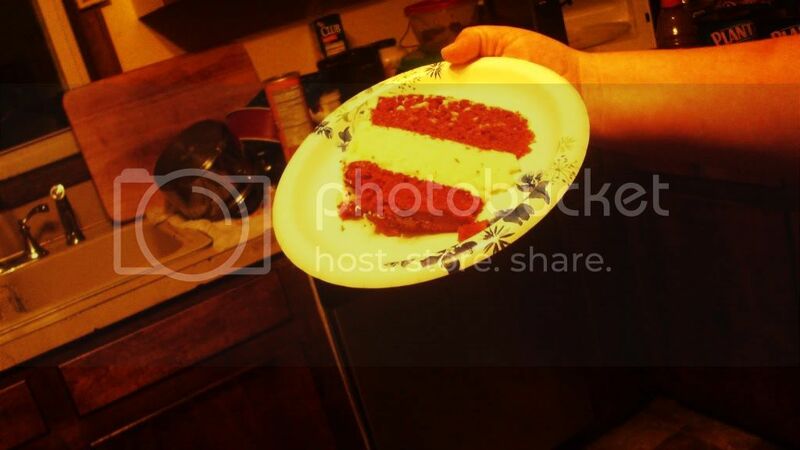 in fact, before i’d gotten home from work the next day, he was already halfway through making the cheesecake layer. THANK YOU FOR TEACHING HIM TO BAKE! i’m TERRIBLE at it! unfortunately, since both of us are pretty cook-stupid, we didn’t have any supplies on hand. so he may have spent upwards of 70 dollars on groceries, a springform, a sifter, an electric mixer… but i’m willing to forgive him because we’re going to make many more. Thank you for this recipe, I recently made this cake for a work friend, she loved it so much and told so many people about it, I have made it 4 more times already. I may have to make this for my lady for Valentines… very nice, thanks – stumbled! Who ever makes it first call me. Lol…. So, thanks to my husband whom found this cake while stumbling. He called me over to the computer, and showed me this great website. He then told me “babe, you need to make this.” And, being in love with cheesecake, I decided why the heck not. I decide to make it the same week my husband found this website, while we were having a get together with my in laws. At first, I did get a little flustered with the baking directions for the cheesecake, but I stepped away from the directions, then re-looked at them, and then they made sense. This cake, was so much fun to make. And, it was a hit. My husband loved it, and so did my mother-in-law (extra points on that) And I did take pictures, so hope everyone likes them. Wow how very inventive! One of my fav desserts nestled inside another? Genius! 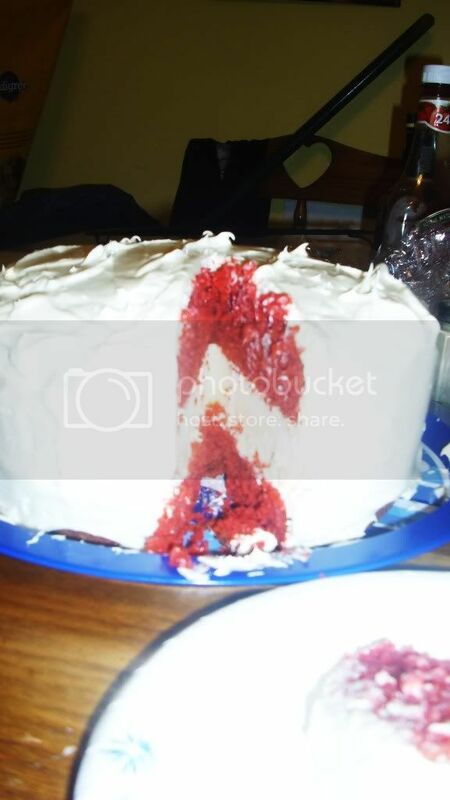 Made this cake for my sister’s birthday in February, 2011 and it was an enormous hit. I folded in 2 egg whites, beaten to stiff peaks to the cake batter to help add height. The layers were pretty even so i did not need the cake strips. I did need to trim the outside of the cheesecake down just slightly but that was no problem. Also added more of a southern feel to it, since I am from Alabama, lol, with toasted pecans on top. usually for my Red Velvet Cake I would have added the pecans to the frosting but I liked the idea of garnishing the top with the toasted pecans better. I am no stranger to baking having made lots of creme brulee, panna cotta, souffles and cakes but this cake gave me renewed confidence in my ability. Something that looks as complicated as this does is not always so. I am now looking into making different flavor combinations with this kind of cake such as coconut cheesecake between pineapple cake layers and of course the thought of chocolate and mocha has already went through my brain. Thanks for the guidance and inspiration. This link was supposed to be on my earlier post so hopefully I’ll do it right this time. This was one of the most fun things I’ve ever made. I used this to ask my boyfriend to prom-being the unorthodox girl I am-and my family, his family, and he all loved it. He is not a huge fan of cream cheese frosting, so I used a whipped cream cheese frosting recipe instead for a lighter flavor, and it was wonderful. The sweetness and richness of the cheesecake and cake was enough. My mom is even asking me to make it again for a family get together this weekend–a lot of work, but I’m willing to do it again just because the end result is so rewarding. Thank you so much for this recipe, it will definitely be bookmarked as a good recipe to impress! 15?! Are you SERIOUS!?! WOW!!! Glad you enjoyed the cake! Have you seen my newest version? Chocolate & Peanut Butter! make this recipe yesterday and it came out perfect!! !..I was attacked by all my friends and family!! !…THANK YOU!!! 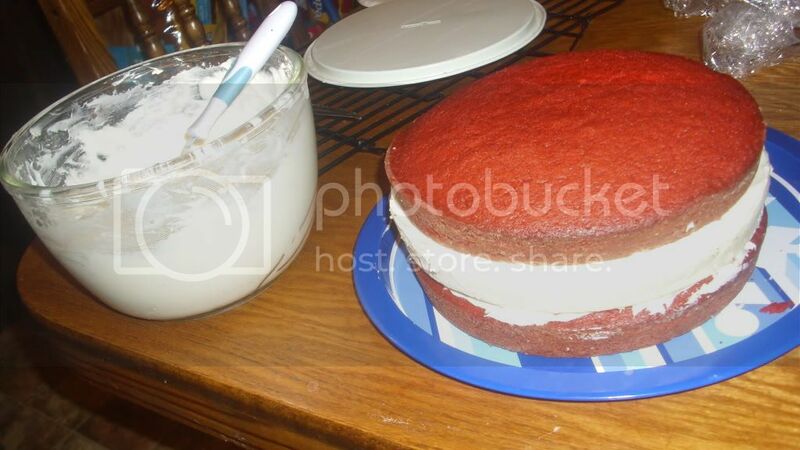 Can I make the Red velvet Cake in one tin and then cut in half to get the two cakes or do they have to be cooked separately? I only have 1 9inch cake tin…. You probably need to bake it in two pans, as that amount of batter won’t fit in 1 regular 9in pan. I think you would probably be fine baking half the batter, letting it cool completely, then baking the remainder of the batter once you wash & dry the pan. Good luck!! I made this for my son’s 15th birthday, and it is AWESOME! It was so much easier than I expected! Thank you so much for the terrific recipe and the great step-by-step instructions and tips! I feel like a professional chef after serving this! When I found this, my jaw dropped!! It looks absolutely amazing!! I am getting all the ingredients together and will be making one for Easter on Sunday and another one for a meeting the following Wednesday. I cannot wait to start making this!! !